An analysis of overfishing in the Philippines and its causes. lthough the destruction of coral reefs and mangroves are significant causes of declines in fish catch, probably the biggest cause is simply too much fishing effort or overfishing. It has been shown that progressive changes in the reef fish community composition will result from sustained fishing with a variety of relatively unselective fishing gear. This effect is made worse by using selective fishing gear such as spear or by focusing on species easily caught. The end result of these pressures will be an exploited community composed largely of the least catchable or desired species of fishes and in which the most prized are extinct or nearly so. Fisheries scientists have defined overfishing from both biological and economic viewpoints. Biological overfishing may be one of three forms (Pauly 1990). The first form, growth overfishing, occurs when fish are caught before they have a chance to grow or when immature fish below the required age for reproduction and harvest are gathered. When the adult fish population is caught in large numbers so that fish reproduction is gravely impaired and recruitment of young fish to replenish stocks is compromised, a second form of overfishing called recruitment overfishing results. If the decline in a once abundant fish stock due to fishing is not compensated for by an increase in the stocks of other species, on the other hand, the consequence is referred to as ecosystem overfishing. are chasing after fewer and fewer fish. Overcapitalization and oversupply of labor. 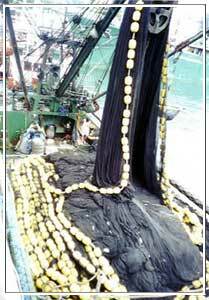 There are too many boats and too many fishers chasing a declining fish stock. Money used to buy boats and other equipment should have been used for other investment opportunities outside of the fishery sector. Labor should also be applied outside of fishing, assuming there are alternatives. Dissipation of economic rent from excess fishing effort and not levying license fees and market controls. Society loses because of an absence of user fees, licenses, and other limits to entry required to increase the cost of fishing. The low cost of entry attracts too many participants in an open-access regime. Loss of consumers and producers surplus (their benefits) as prices go up for consumers and profits decline for producers. Consumers are plagued with high prices and producers experience declining profits and eventually losses. Depreciation of asset value of the resource. In the Philippines, we are losing more than US$400 million a year to overfishing of demersal and small pelagic species (Dalzell et al. 1987). Meanwhile, total net present value of quantifiable loss from overfishing 1 km2 of coral reef over a 25-year period and discounted at 10 percent is US$108,900. Overexploitation in the Lingayen Gulf fisheries has resulted in depreciation of PhP390 million/year from the time maximum economic yield was reached during the mid-1980s (Trinidad et al. 1993; Padilla et al. 1997; White and Cruz-Trinidad 1998). Determine an appropriate measure of fishing effort, i.e., number of fishers, number and/or tonnage or horsepower of boat, time spent, etc. All of the above indicators used to determine the presence and extent of overfishing depend on some type of historical records or memories. There must be a base point in the past from which recent or present data can be compared. Time series analysis cannot be pursued without some data from the past in credible form. Oftentimes the only reliable source of such data is through interviews with people who have lived and worked in the area for 15 or more years and are able to recollect the way it was before. Fishers who have used the same methods for many years in the same area are excellent sources because they measure their catch every time they fish. In the Philippines, the direct cause of overfishing - excessive fishing effort - is easy enough to explain, but the underlying causes of overfishing and the conditions that encourage it are far more complex. Clearly, excessive effort occurs in an open-access fishing regime, but what controls the number of fishers in the first place? Human population growth that doubles in about 35 years is a major factor, but the endless influx of people to coastal areas reflects not only the countrys weak population program - it also reflects the failure of other economic sectors to provide sustained employment. The economic context and availability of alternative employment determine who decides to fish. A weak economy and the lack of economic opportunities result in unemployment and increased poverty. Poverty increases the number of fishers - landless and having nowhere to go, the unemployed are pushed to the coastal zone and many turn to fishing for a living. As their numbers increase, poor fishers become a major factor in the mass destruction of fish habitats through the use of destructive fishing methods and the application of too much fishing effort. Lack of law enforcement then enters the equation because most destructive fishing practices have long been illegal! And, without instruments to limit access, the influx of fishers continues. Excessive fishing effort is linked to other issues as well. Government policy has certainly contributed to overfishing in the Philippines. During the 1960s and 1970s, the government encouraged capital investment in fisheries and full exploitation of fish stocks, luring fishers with the prospect of earning profits from very little investment. In fact, however, the fishing industry has been operating largely on government studies. Cost and returns studies indicate that more than 90 percent of the production cost in the fishing business is actually operating cost, and that fixed costs such as licenses, taxes and fees are very minimal (DAP 1997). The Lingayen Gulf experience provides a classic example of how the explosion of fisher population - and the corresponding increase in the number, power, and efficiency of fishing gear - can deplete fishery stocks to alarming levels. Fig. 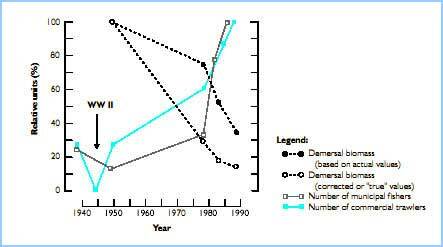 1 shows how demersal biomass in the Gulf decreased steadily as fisher population increased between 1950 and 1980, and then plummeted when the population exploded in the 1980s (Silvestre 1990). The trend may well be projected to a national scale: nationwide, during a 40-year period beginning in 1948, the total number of vessels in the municipal sector has grown from an estimated 20,000 (83 percent of which were non-motorized) to 500,000 units (with a higher portion of motorized boats) (Dalzell and Corpuz 1990). No exclusivity of use. Not only are coastal dwellers entitled to use the resource but also fishers from contiguous municipalities, those from distant municipalities, and those from the agricultural communities and uplands as well. No limits to use. Each fisher decides on where to fish, how many hours to fish, and what gear to use. Indeterminate physical boundaries. The difficulty of excluding potential users is exacerbated by the inability to apportion areas to selected users. If this problem is surmounted by legal means, the difficulty of enforcing the rule becomes the corollary concern. In an open access regime, an individual fisher is viewed as a rational economic being who engages in an optimizing behavior, that is, to catch the greatest number of fish possible. Knowing that the resource is accessible to everybody, the individuals rational reaction would be to harvest as much as one can for today, because tomorrow it might be on another fishers plate! The aggregate effect of all fishers thinking in the same manner is disastrous to the resource. This is what we call the tragedy of the commons (Hardin 1968). Mary Gleason - Consultant, Tetra Tech EM Inc.
Copes, P. 1972. Faster rents, sole ownership, and the optimum level of fisheries exploitation. Newsl. Tech. Econ. Soc. Stud. 40: 145-163. Dalzell, P. and P. Corpuz. 1990. The present status of small pelagic fisheries in the Philippines, p. 25-51. In C.R. Pagdilao and C.D. Garcia (eds.) Philippine tuna and small pelagic fisheries: Status and prospects for development. Proceedings of a Seminar-Workshop, 27-29 July 1988, Zamboanga State College of Marine Science and Technology, Zamboanga City. Philippine Council for Aquatic and Marine Research and Development, Los Baños, Laguna, Philippines. Dalzell, P., P. Corpuz, R. Ganaden, and D. Pauly. 1987. Estimation of maximum of sustainable yield and maximum economic rent from the Philippines small pelagic fisheries. Bureau of Fisheries and Aquatic Resources Tech. Pap. Ser. 10(3), 23 p.
DAP. 1997. Population Resources, Environment and the Philippine Future (PREPF). Volume II-3B. 1138-1387pp. Development Academy of the Philippines. Manila, Philippines. Hardin, G. 1968. The tragedy of the commons. Science 162: 1243-1248. Oakerson, R.J. 1985. Model for the analysis of common property problems, p. 13-30. In Proceedings of the conference on common property resource management, National Research Council, Washington D.C., National Academy Press. Padilla, J.E., L.Castro, A. Morales, and C. Naz. 1997. Evaluation of economy-environment interactions in the Lingayan Gulf Basin: A partial area-based environmental accounting approach. Final Report. Draft. Department of Environment and Natural Resources, Quezon City, Philippines. Pauly, D. 1990. On Malthusian overfishing. Naga, the ICLARM Quarterly 13(1):3-4. Silvestre, G.T. 1990. Overexploitation of demersal stocks in Lingayen Gulf, Philippines, p. 973-976. In R. Hirano and I. Hanyu (eds.) The second Asian fisheries forum. Asian Fisheries Society, Manila, Philippines.